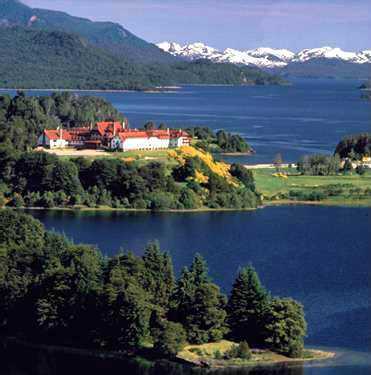 Built in 1940 by Architect Alejandro Bustillo, Llao Llao Resort Hotel, Golf & Spa is an exclusive deluxe property located 16 miles from the alpine town of Bariloche, beautifully positioned on top of a hill between Lake Nahuel Huapi and Lake Moreno within stunning view of Mt. Lopez, Mt. Capilla and the majestic Mt. Tronador. Completely refurbished in 1993, the hotel has 147 double rooms, 11 suites and one cabin. For family groups there are connecting or adjacent rooms. All rooms and suites are equipped with: Air-conditioning, central heating, telephone, cable television, safety box, and minibar. Hotel amenities include restaurant, cafeteria, 24-hour room service, valet and laundry services, swimming pool, fitness center, sauna, solarium, tennis court, golf course, water sports, and meeting facilities. Enjoy 18 holes of golf framed by the pristine lakes and the towering Andes mountains, surrounded by centennial forests of cypress and cohiues (a local tree). Llao Llao Spa offers an array of facial and body revitalizing treatments whose concern is body care and rest. Targeting men and women alike, it offers tailored programs to meet individual needs. It is the ideal place to relax. Among the many things to do, ecotourism abounds with fly fishing, photo safaris, condor watching, trekking, mountain biking, archery, canoeing and rafting programs available. There are two child care facilities with appropriate recreational activities for babies six months to three years, and children 3-12 years old. Live an unforgettable experience in the Nahuel Huapi National Park, in the heart of Argentine Patagonia, while staying at one of the most exhilarating hotels in the world! Buffet breakfast included.